The Bose soundbars use proprietary ADAPTiQ technology to acoustically adjust to their surroundings, and HDMI Audio Return Channel (ARC) for compatibility with future technology. Bose has launched new smart speaker and soundbars in India. The Bose soundbars use company's proprietary ADAPTiQ technology to acoustically adjust to their surroundings, and HDMI Audio Return Channel (ARC) for compatibility with future technology. The Home Speaker 500 will retail for Rs 39,000 whereas the Soundbar 500 and 700 will retail for Rs 59,000 and Rs 79,000, respectively starting October 11 at Bose stores, select resellers (Croma, Reliance, ezone, Lotus, Lulu, Vijay sales) and on the online platforms boseindia.com, Amazon.in and Flipkart.com. Today, Bose begins the next chapter in its legendary home audio history with a new wireless smart speaker and two new smart soundbars— the Bose Home Speaker 500 for music, and the Bose Soundbar 700 and Soundbar 500 for music and home theater. Each crushes the limitations of spaciousness from a single enclosure, combining size-defying performance with superior voice pickup and the power of Amazon Alexa now, other voice assistants to follow, and AirPlay 2 for simple streaming from Apple devices added in early 2019. Engineered from the ground up, the new Bose smart speaker and soundbars use the proprietary mic technology found in Bose headsets and headphones to hear commands better over louder listening levels. 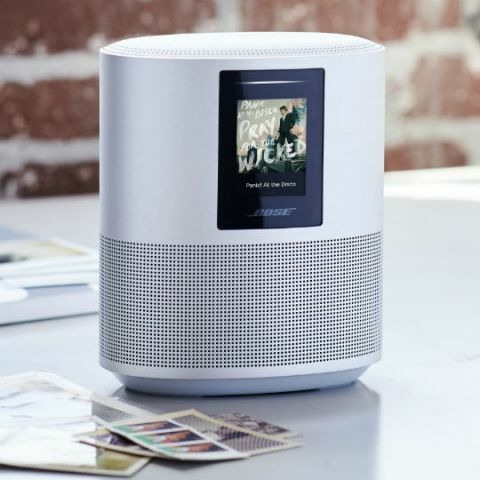 With Bluetooth, Wi-Fi, and Alexa built in, they deliver instant, easy access to millions of songs and tens of thousands of skills for information, entertainment, smart home control, and more. They work brilliantly alone or together as a multi-room system. The new Bose Home Speaker and Soundbars use advanced Bose mic technology developed over years of research for Bose commercial headsets, consumer headphones, and other applications — past and future. They each feature a custom-designed eight-microphone array precisely positioned for accurate near-field and far-field voice pickup — when it’s quiet, noisy, or your music is playing loudly. Whether you’re close by or across the room, or a playlist is set for the background, a party, or competing with conversation, they’ll hear you the first time. The Bose Home Speaker 500 has the widest soundstage of any smart speaker available today. It’s wrapped in seamless anodized aluminum, is a mere "20cm high x 15cm wide x 10cm deep, and uses two custom drivers pointed in opposite directions — so sound reflects off surrounding walls, separating instruments to the far left and right, and placing vocals where the artist did. The result is powerful and lifelike — without artificial effects or distortion. And when touch control is preferred, or the phone is out of reach, there are buttons for basic functionality located right on top. The Bose Soundbar 700 was engineered to outperform every other product in its category, matching its stunning performance with equally stunning design. At just over 5cm high by 10cm deep and 96 cm long, it has curved clean lines, a wraparound metal grille, and a gorgeous tempered glass top. Inside, it’s packed with proprietary technology. Bose PhaseGuides have to be heard to be believed, sending multiple channels of a soundtrack or song throughout a space, placing discrete sound in places where there are no speakers. Bose DSP, custom low-profile transducers, and QuietPort technology deliver exceptional detail and depth for your favorite tracks, crystal clear dialogue for Netflix, and dramatic realism for sports. To manage the TV or other connected equipment, the Bose Soundbar 700 also comes with an intelligent universal remote. The Home Speaker 500 will retail for INR 39,000 whereas the Soundbar 500 and 700 will retail for INR 59,000 and INR 79,000, respectively starting 11th October 2018 at Bose stores, select resellers (Croma, Reliance, ezone, Lotus, Lulu, Vijay sales) and on the online platforms boseindia.com, Amazon.in and Flipkart.com.